For all of the 25 years I’ve lived in the south of Cambridge, nothing gets residents more worked up than parking. I promised several people I’d write an article this week about residents parking schemes, and so I’ve spent the last few days reading council documents, petitions, residents circulars and more. My head is spinning. But here goes! Feedback to the council about the Morley scheme is invited now – the closing date is next Friday, 17th February. 1. What’s already in place elsewhere in the city? All the streets in the centre of Cambridge have ‘residents parking schemes’. Permits to park each car cost in the region of £50 to £80 per year, and there may be a one-off, set-up cost of about a year’s charge for each permit. Residents can also apply for visitor permits, allowing visitors to park for a number of short visits. Parking bays are not assigned to individual properties, so a permit does not guarantee that a parking space will be available. But you can park anywhere in your ‘zone’. In general, the result is that the streets are not full of commuters’ cars. Full details on the existing schemes can be found here. Some residents of the older roads from Cherry Hinton Road down to Blinco Grove have been campaigning for many years to be added to the zones which have residents parking schemes. 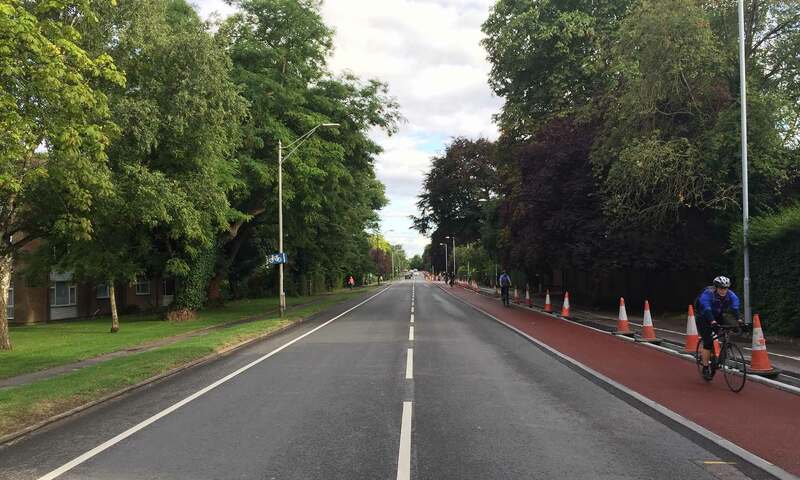 Most of the houses in these roads have no off-street parking, and their street space is much in demand by local businesses, Hills Road Sixth Form College, tradespeople, hospital staff, Leisure Park users and railway station commuters. It can be chaotic for some. Last November, Cambridgeshire County Council consulted on what it calls the ‘Morley Residents Parking Scheme’ with residents from these roads (Blinco Grove, Hartington Grove, Rathmore Road, Rathmore Close, Magnolia Close, Marshall Road and Rock Road). Only 40% of properties replied, but of those which did, 59% were in favour of the plan (or 63% of those expressing a preference). Full details of the consultation, and a map of the plan, can be found here. In summary, within this area all on-street parking will be divided into resident permit holder bays, ‘Pay and Display’ bays, limited waiting parking bays or there will be a 24 hour waiting restriction. Any resident with a permit for the area will be able to park anywhere within the area. The scheme will operate from Monday to Friday, between 10am to 7pm. There are no restrictions overnight. Residents’ annual permits will cost £50 and the one-off ‘installation fee’ will be £52. This is still a consultation, so residents views are actively being sought, even those who completed the previous survey. But please note that if you want to have your say, for or against, the closing date is next Friday, 17th February. You do not have to live in the area covered by the scheme to make a comment. Details are on the web page about the TRO above. On 13th March, a committee of City and County Councillors (‘The Cambridge Joint Area Traffic Committee’) will determine whether the TRO should proceed, taking into account the feedback it has received. Our County Councillor, Amanda Taylor, tells me that the scheme is supported by a majority of residents and so will press for it to be implemented. She has read the letter objecting to the scheme above, but queries a couple of statements in it, especially the claims relating to the City Deal. She also says that if the scheme were postponed, it would be postponed for quite a long time. Consultations on new schemes may start after the May elections, “but the whole city will not be surveyed simultaneously. Newnham, Accordia and Coleridge will go first.” The Morley area would then join the rest of Cambridge in waiting for its chance. The story was covered on BBC Radio Cambridgeshire on Friday, although the piece did rather make it seem like a “residents against the council” issue, which is a little unfair, particularly towards the council, who have only been doing their best to respond to residents. You can hear it here. So what about the idea that the whole city should have residents parking schemes? Certainly the problem with the piecemeal approach to tackling streets with the biggest problems just displaces the issue. Some cars coming into the city and currently parking in the Morley Residents Parking Scheme area will just move to adjacent roads, such as Baldock Way and Cavendish Avenue. The displacement may not just be during the day. Some residents might decide that it’s easier to park their cars five minutes’ walk away than pay for permits. A lot of work has been done on this issue by Smarter Cambridge Transport, a group of impartial volunteers from across the region trying to seek out the best transport-related ideas for the area (full disclosure: I am a member of this group). I cannot stress enough how good the Smarter Cambridge Transport paper is. If you don’t have time to read it all, I would recommend this article by Lynn Hieatt, published in the Cambridge Independent last autumn. It talks a lot of sense. 6. Residents Parking for the whole of Queen Edith’s? The County Council now accepts the argument that free on-street parking acts as a magnet for traffic and therefore contributes to congestion. It is creating “a framework for the consideration of the introduction/extension of formalised Residents’ Parking Schemes” and a “Parking Schemes Extension Delivery Plan”, both of which can be read here. These could be approved as soon as March. Under the council plan, almost all of the city will eventually get the chance to implement residents parking schemes. The outer areas of the city (including Queen Edith’s) will be divided into zones (above) which will have similar consultations as have been undertaken in the Morley Residents scheme. Again, in each case, if there’s a 50% response in favour, a residents parking scheme may be implemented in that zone. As a bonus, it’s likely that the City Deal will support the move, and while any final decisions will be left to local residents, it is likely to offer some sort of financial incentive to encourage take-up – possibly retrospectively including the Morley scheme. The bulk of Queen Edith’s has been divided into four zones, in addition to the Morley zone. Our new neighbours in the Lichfield Road and Cherry Hinton Road areas will be part of zones stretching down from the Coleridge area. Expect to be consulted some time in the next year or two about having a residents parking scheme in place across the zone where you live. I will of course try to keep you informed. Please read this update, written six weeks after this article, from County Councillor Amanda Taylor. I hope this isn’t a dopey question… If we are in the Morley area and purchase a residents permit, do you think we would be able to park in a residents bay in the Glebe area eventually – we park on Glebe Rd to carry ‘big stuff’ to our allotment from time to time? No, the various residents’ parking zones are discrete, so if you live in the Morley zone you cannot park in another zone within the restricted hours. You are welcome to park in our drive in Holbrook Road for the odd visit! Perhaps you could choose a time to deliver your big stuff outside the restricted times. e.g. if the RP times for Glebe were to be 9am-5pm Mon-Fri, then choose after 5pm during the week or any time Sat or Sun. In Netherhall Way, we do not want residents parking permits. What we want is a single yellow line down one side of the road with No Parking Mon to Fri 9.00 til 5pm. This will cut down on obstruction and as a lot of us have drives so day time parking will not be a huge problem. Plus I am led to believe that the costs will not be as great. Last month we put in an application to the County Council for single yellows in Netherhall Way and for double yellow lines on the junction with Chalk Grove — hope to hear soon whether it was successful. I listened to the radio clip and I have to say am quite annoyed at how the issue was presented. I’ve lived on Hartington Grove for six years and always had problems parking. My neighbours who have lived here for a lot longer also feel the same way. It took a lot of work to get the Council to listen to us and do something. Residents had a number of opportunities to have their say and these increasingly hysterical leaflets are clearly from the minority who were not in favour. Most people I know who live around here are in favour and I suspect this group were probably against any scheme at all. It’s irritating that they have managed to misrepresent the issue on the radio. Marshall Road will be losing those spaces in any event as part of the City Deal and so this is a red herring. I agree with Jan H that a single yellow line on one side only is best for Netherhall Way. It is absolutely untrue that Marshall Rd will lose those spaces anyway – that has not been decided. I cannot believe they could implement no pavement parking as they’d have to do the same off Mill Rd and there would be outcry. Where would all those people park? The resident on the clip has 3 vehicles (inc. two 4x4s!) so that might explain his resistance. I have seen him bully his way into a space and he certainly hasn’t lived on the street that long. I also think that the reporter’s comment that if we can afford to live round here then we can afford a permit was ridiculous. Some people have lived in the area for years. As the council reports started with a mixture of residents, resident’s and residents’, I had to mull this over too. I decided it is parking for lots of residents rather than just for one resident, and therefore went for the apostrophe after the ‘s’. But this could prove more contentious that the traffic order itself! Initially in favour, I’m now against the scheme. Once 7pm passes and visitors park to go to The Leisure Centre or return to their own spaceless apartments where will residents park then? We are trapped in during the day now but will be trapped at night if this goes through. But why would post-7pm be any different with the RP scheme than it is now? Where do such Leisure Centre visitors park after 7pm at present? Because they’ll be a lot fewer spaces. More than half the spaces currently on Marshall Rd! Once the RP restrictions are over, it’s a free for all. Nightingale Avenue is quite hazardous to negotiate with the narrow area of the road left to drive on, due to the constant parking on the Nightingale Park side of the road. Despite the 20mph speed limit, it is quite a dangerous road for cyclists and drivers. It is impossible for two cars to pass each other apart from where other roads join the avenue. What proposals are there for this danger spot? Due to the legislative requirements on size for marked bays, it has been stated that the total number of potential places would be reduced from the current reality. Non-resident parking, as has been commented by others, is no-longer as problematic (since the completion of major building works in the area and efforts from Hills Road VIth form college to reduce the impact of student parking) as it was when the initial surveys and consultations were undertaken. This is a tacit admission that the parking places will be knowingly oversold, to finance the maintenance and upkeep of a system that does not benefit residents, whom become a customer in this scenario. I for one would feel aggrieved to be forced to pay for something I currently get for free, in order to fund a system I do not want or benefit from. I can only imagine the exasperation and anger I’d feel the first time, expensive parking permit in hand, I find myself driving around unable to find a parking place! Worst still I have to drive past long stretches of newly introduced pay-and-display bays sat unused, as one finds in other areas with similarly ill-conceived schemes. There is also a potential detriment to both the environment and aesthetic of the area, as more households feel need to convert front gardens into driveways. Furthermore, the scheme only serves as a divisive tool to consolidate the ‘them and us’ attitude that we residents naturally feel when parking, presumably by non-residents, inconveniences us. I’ll be the first to admit to this frustration, however as a rational human being I can realise that anyone parking in this area has reason to do so, and banning people from parking here will inevitably only shift this problem to somewhere else. Implicitly, those of us affected want to be able to have vehicles near our houses, be it our own, or those of visitors to us, the whole point of which is surely about transporting people to places. Are we that short-sighted that we don’t see that we want these vehicles to be able to get to places at the other end of the journey? Or that selfish that we cannot realise the impact on those individuals we’re trying to prohibit from utilising parking near their destination, exactly as we all wish to do somewhere else with our own journeys? As such, the emphasis should be on attempting to maximise the number of parking places available to all. We should seek to discourage inconsiderate parking and uphold ourselves to these same standards, parking on our own driveways wherever possible, or ensuring as much room is available to others when parking on the street. We should seek to choose appropriate spaces for the size of vehicle we own. We should challenge the reduction of on-street parking available, where curbs have been unlawfully dropped, or where restrictions (double yellow lines and H marks) are excessive or superfluous. We should consider the impact of visiting vehicles, and open discourse whereby non-residents do cause issues with thoughtless parking. Sure, this is an impossible endeavour towards an imperfect solution, but surely paying the council to give us fewer parking places cannot be preferable? One of the aims of the City Deal is to reduce traffic (and hence pollution) in the city – an aim supported by virtually everybody. At present the availability of free parking in residential streets encourages commuters to bypass the P & R sites and drive into the city to take advantage of the free street parking. I agree that the introduction of an RP scheme would end this practice and encourage the use of the P & R sites which were constructed for just such a purpose and are now poorly utilised. And I agree that a virtuous circle of more use of buses and consequently better, faster and more numerous bus services would be a realistic aim. And if the £1 charge for the P & R sites could be abolished at the same time that would be a good move. When purchasing a house in Rathmore Close, we were assured that parking would be available in the close, we now find that it is a red lined area – how will tradesmen and delivery people be able to park to maintain the building, they frequently need access to their vehicles for materials?? From whom does once acquire a visitors pass and does it have a time restriction? Work can take several days. Will we be informed about when all these restrictions are to take place and where to acquire passes? Delivery vehicles are allowed to park on yellow lines for the purposes of loading or offloading, provided there is not a loading restriction in place. Residents can purchase a visitor’s pass for tradespeople and other visitors (you don’t need to hold a resident’s parking permit to buy a visitor’s permit).